We recently went to one of my favorite Greek restaurants and I ordered my favorite dish, the shrimp wrap. I had eaten there multiple times but for some reason, the cook working this time didn't know how to make it... twice. I was super disappointed so we had to replicate it at home so I could get my fix! Lucky for you, this means you now get to experience the best shrimp wrap ever. Heat the olive oil in a medium skillet. Coat the shrimp in the cajun seasoning and sauté in the oil until blackened and fully cooked. Let cool. While the shrimp is cooling, chop the rest of the ingredients. Drizzle the spinach or kale with half of the aioli and toss to coat. Let sit in the refrigerator for 10 minutes. When the shrimp is cool, chop and combine with the greens. Mix in the rest of the chopped ingredients and aioli. 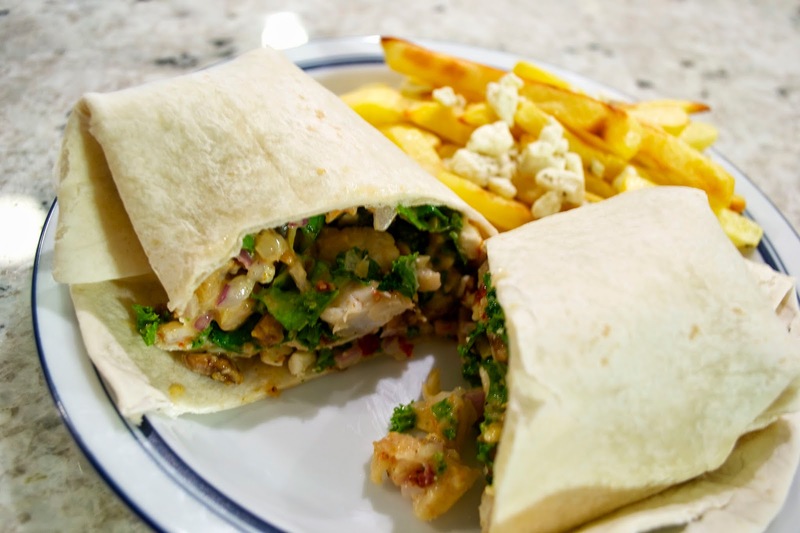 Fill a warm wrap with the filling, close and eat up! This goes really well with some fries topped with feta cheese!